This potato salad is absolutely delicious, especially if you’re not a fan of traditional potato salad loaded with mayonnaise. Red potatoes provide vitamin C, vitamin B6, potassium, iron, and dietary fiber. Eaten with their skins on, they are even higher in fiber. I found this recipe from Paula Deen and was surprised to see a lighter recipe from her, but the ratings were 5 stars so I figured it had to be good! I modified it a bit further reduce the points, but you would never know. 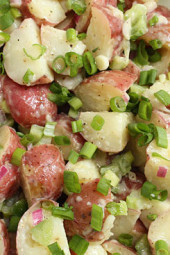 This potato salad is a keeper and got lots of kudos at my Father’s Day luncheon. Boil potatoes in salted water until soft, approx 10 minutes. While the potatoes are boiling, combine red onion, green pepper, mustard, olive oil, vinegar and mayonnaise and season with salt and pepper. Mix well and let the flavors marinade while the potatoes cook. Once the potatoes are done and cool, mix into the bowl and add scallions and additional salt and pepper to taste. Serve room temperature or refrigerate until ready to serve. Awesome. I love that mayo is not the first taste. This is what potato salad should be. I made the recipe as described and this is my one and only potato salad going forward.. A family favorite, perfect light side for those picky eaters in the house. This is now the only potato salad my family wants to eat! it was ok but regular potato salad is better, i question whether it has alot less calories than mayonnaise salad since oil and mayonnaise have the same calories. i would not serve this to company. it doesn’t look that great. i overcooked the potatoes so the skin actually looked brown (my fault). i think i would take the skin off next time. I have a person in my family allergic to red onions, recommendation on a substitution? Thanks! You could substitute a difference onion, or if the allergy it so all onions you could just leave it out. This is really outstanding! Be sure to leave plenty of time for the potatoes to cool. I doubled the recipe and added finely chopped jalapeno and a little fresh garlic. Next time I’m going to try plain yogurt in place of the mayo. Also, I like the taters a bit smaller than in the pic, and a little al dente. When you add cold potatoes to boiling water, it takes a couple minutes to come back to a boil. I found about 13 minutes from the time you add them is perfect. 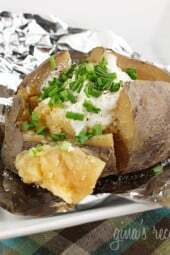 QUESTION – do ypu boil the potatoes whole and then cut them up or boil them cut?? I really want to make this but since baby reds are so small did not want to make mistake and have it not turn out fabulous!!!!! Pingback: Simple tricks to help you throw a better BBQ - Noom Inc. | Noom Inc. I made the baby red potato salad to go with hamburgers and corn on the cob. At first, I was a little nervous trying a different potato salad (usually use a mayo based, southern style salad) but this was so easy and I didn’t spend all day chopping and testing for doneness on the potatoes. I served it to my husband and he turned and said this was the absolute best potato salad I have made in years. This is now the only one I will ever make. Thank you so much for posting this. A new go to for summer picnics! I made this the other night for the family and they LOVED it! I had just enough for leftovers for lunch the following day. My husband doesn’t eat mayo, so I used a little light sour cream and plain yogurt as the dressing. I made this today to go with a smoked brisket! Omg. So good! Thank you Gina for all of your delicious recipes! Made this tonight with your "Garlic Lover's Roast," and of course my family of 7 loved every bite of each dish! The only thing I added was a little cayenne because I like it hot. I loooved this potato salad though. I'm not a fan of the mayo heavy potato salad, this was perfect! Made this tonight added some for spices and omitted the green pepper and red onion because I didn't have it but this was VERY tasty! Would definitely make again and it was really creamy even though it had very little mayo in it! I added a tsp of honey and a few sprinkles of paprika… oh my gosh! Delish! I added grilled chicken, yellow bells, and orange bells to this. SO GOOD! Thanks so much for sharing! So good! I swapped the green pepper for celery since that's what I had, very good. I am so sorry excited to make this for my husbands surprise BBQ/party on Thursday I can hardly stand it. I have been using your recipes for 4 months now and have lost over 20 pounds the best part is my husband can't even tell their diet recipes they're just so good! It was delicious. My husband couldn't stop eating it. The only change I made was to add some fresh dill because I love dill in my potato salad. Otherwise, it was perfect as is. Thank you! This look great, but for the bell pepper can't eat any of the bell family. What would you suggest for another raw pepper that I can use? 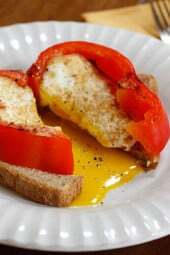 I tried this but added another half amount of ingredients and two hard boiled eggs. DELICIOUS! My hubby had some and loved it! I told him not bad for low fat as I was gobbling it down and he said I think it only counts as low fat if you don't eat it all in one sitting haha but it was so good! I loved it, hubby prefers the mayo style. Add lots of salt, for the best flavor. I salted the water, and salted the wet ingredients, but had to add salt 2 more times. I thought it was perfect though! May add some hard-boiled egg next time. I have been making this potato salad all summer. Since on WW I stayed away from potato salads, but found this version and honestly have to say that my entire family enjoys it more than the recipe that calls for all the mayo. Thank you. Try this version, you wont be disappointed. So Yummy! Hubby loves it too. So light and refreshing. best potato salad ever! Just made it and it tastes delicious. I bet it will be even better when it sits for a couple hours until dinner time. My mayo was expired so I used sour cream, and I might stir in some chopped parsley just becausevi have so much. Thanks for a new favorite. In response to the post that the WW points do not seem to compute, I am currently on WW and use E-Tools. I went on the WW Site and using the points calculator on track your food page, this potato salad checked out right on point. It is 3 points per serving. I used the following numbers. 3 fat, 18 carbs, 2 fiber and 2 protein and it computed out to 3 points plus per serving. I checked other recipes also, I think it was the Bangin Good Grilled Shrimp and the Eggplant Parm and those computed out to the same amount of points Plus also. I think your recipes are WW points plus accurate at least from my calculations on the WW website. Yes, I am really careful to avoid mistakes, although it happens from time to time, but they are usually caught right away from you lovely fans! I love this recipe. 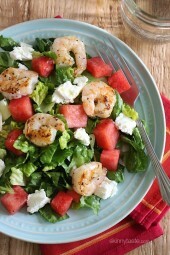 It is light, great for summer, easy and low in calories!! I really am glad I stumbled on your site! You rock!! This was delicious! I actually doubled the "sauce" part of the recipe. Used low fat mayo. I have made this twice so far. It is delicious!!! Made this and substituted reduced fat sour cream for the mayo. Served it warm and it was delicious! Hello, just found this site. I love it so far. I make potato salad with mustard, very little mayo. Have you ever made it that way? I make mine with mustard, and a bit of broth to reduce the amount of oil. Always nice and moist. I made this and it was wonderful! Very easy, and still very tasty for being so much lighter than the traditional deli potato salad. I liked the ratio of potatoes to sauce; they were well-covered without totally swimming in it, so I would definitely suggest sticking to the measurements. It was a great side for a grilling out night. This potato salad was delicious!!! I used a bag of baby red, purple and gold potatoes which added even more color to the salad. Next time I think I will do the greek yogurt which was suggested in previous posts because my husband and I are greek yogurt fanatics. I made this over the weekend and it was delish! I will use this recipe from now on! Thank you Gina! I saw this on Pinterest and made it tonight….YUM!! You are the best! My children are allergic to eggs. Subbed in greek yogurt and this salad was great. I have found using kosher salt, really helps season potatoes. I made this two days ago and it did not last, so am making another batch as I type this. I left out the mayo and it was still good! YUM!!! Trying this for our 4th of July bbq tonight…it looks delicious!! We are always looking for healthier versions of our favorite foods and we use a lot of your amazing recipes! I just made this for our July 4th BBQ and it is soooooooooooooo good!!! Made this for the 4th today!!! Oh my gosh! Fantastic!!! Perfect! 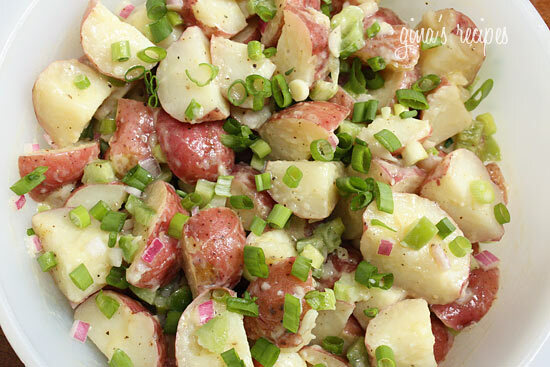 I love a lighter potato salad with lots of zing and zest! 🙂 Thank you! Made this for 4th of July picnic. It made enough for 6-7 people to have 1 scoop. If you have a big event, you might want to double the recipe. I'm from the south and we're used to a creamy potato salad, but everyone said it tasted good. I added a tbsp of honey mustard b/c I don't like the taste of dijon. I did make the "dressing" and then leave it in the cooler for about 6 hours and it smelled wonderful when I took it out (much better than when I made it). I'll make this again for my family. I bet honey mustard was lovely. Made this last night (my first skinnytaste recipe) and it was great! So light and flavorful. We had it with grilled pork chops cooked in dijon. Thanks!